After winning a free fuel card loaded with 1,000 gasoline gallon equivalents of compressed natural gas (CNG) from Westport and Clean Energy Fuels, Wayne Snead says he won’t need to pay to fill up his natural gas vehicle (NGV) for a long time. “I love it,” Wayne says. 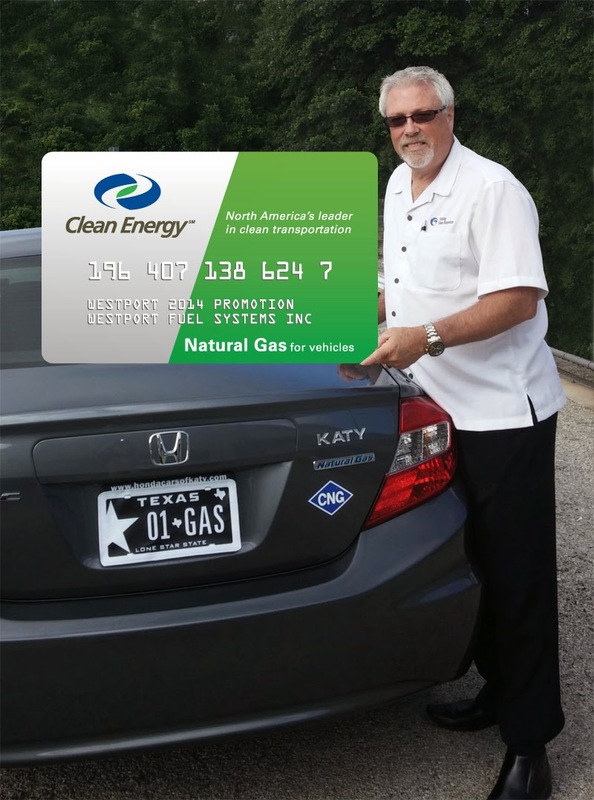 “I’m set for three to four years.” He who won the card after the Greater Houston Natural Gas Vehicle Alliance (GHNGVA) did a draw for the free fuel card amongst its members after the GHNGVA won the card from a Westport social media contest in May. from Westport and Clean Energy Fuels. Wayne is a CNG specialist in business development in Austin, Texas at Texas Gas Service. Both in his job at Texas Gas and as a member of the GHNGVA, he’s a proponent of expanding the number of natural gas stations in Texas. Texas Gas operates a Conservation Program which provides more than one million dollars annually through rebates to customers who switch to natural gas. The program webpage explains the rebate options available for the purchase of an NGV for businesses or residents. “I decided to start walking the talk,” Wayne says of his decision to purchase a Honda Civic GX around six weeks ago. Currently he says he pays $17 to fill up his eight gallon tank, getting around 250 miles (400 kms) per tank for city driving and 300 miles (482 kms) for highway. Usually he fills up at the Clean Energy Station at Austin-Bergstrom International Airport. Thanks to his free fuel card, Wayne won’t be paying to fill up his NGV anytime soon.